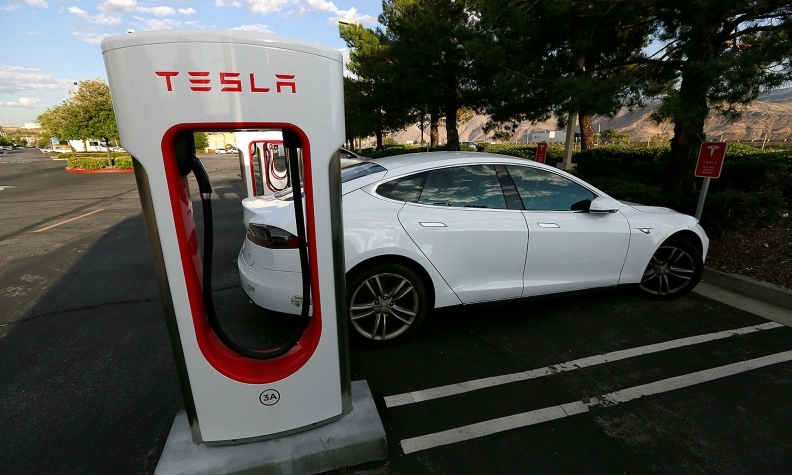 A boom in electric vehicles made by the likes of Tesla Motors Inc. and General Motors could erode as much as 10 per cent of global gasoline demand by 2035, according to the oil industry consultant Wood Mackenzie. While battery-powered cars and trucks today represent less than one per cent of total vehicle sales, they are expected to take off after 2025 as governments move to tackle pollution and costs fall, the Houston-based analyst said. By 2035 so-called EVs may remove 1 million to 2 million barrels a day of oil demand from the market. That's in the range of the production cut OPEC and its allies agreed to in late November in order to end a three-year crude surplus. Wood Mackenzie’s view echoes the International Energy Agency, which last month forecast global gasoline demand has all but peaked because of more efficient cars and the spread of EVs. The agency expects total oil demand to keep growing for decades, driven by shipping, trucking, aviation and petrochemical industries. That’s more conservative than Bloomberg New Energy Finance’s forecast for EVs to displace about 8 million barrels a day of demand by 2035. That will rise to 13 million barrels a day by 2040, which amounts of about 14 per cent of estimated crude oil demand in 2016, the London-based researcher said. 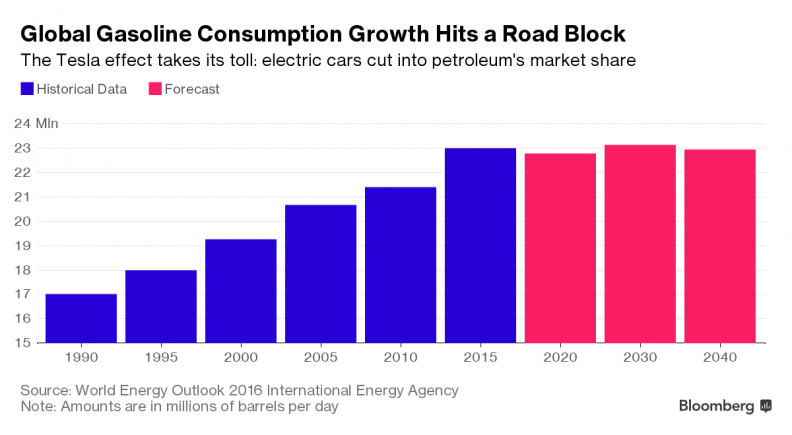 Electric cars are displacing about 50,000 barrels a day of demand now, Wood Mackenzie said. On Friday Athens, Madrid, Mexico City and Paris pledged to phase out diesel vehicles by 2025 in a battle against pollution, a move that could further stimulate demand for EVs that have zero tailpipe emissions. Tesla alone won’t be able to supply enough EVs if demand really takes off, Gelder said. Major automakers including Volkswagen AG, General Motors and Ford Motor Co. will need to produce them on a larger scale. “At the moment they can’t, and changing manufacturing lines takes time,” Gelder said.